Just as Raymond Chandler’s Philip Marlowe admired small, brave men who stick to their principles, I like—in the movies at least—heavyset, flamboyant types who walk and talk as if life were a poem, whether dainty or grating, lyrical or bombastic. Not least because they pose an alternative to “lean and hungry” male leads, Oliver Hardy, W. C. Fields, Orson Welles, Sydney Greenstreet, Raimu, Francis L. Sullivan, Robert Morley, Philippe Noiret, Burl Ives, and Robbie Coltrane have privileged cinema with their weighty presence. 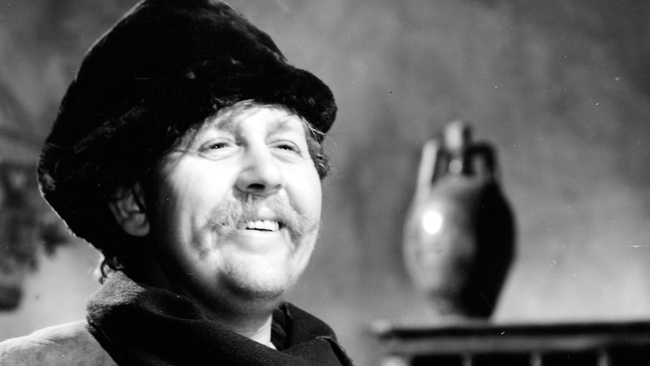 Charles Laughton (1899–1962) would have been extraordinary whatever his girth, but ampleness lent him enormous emotional heft. The screen can barely contain him at times: when, in The Private Life of Henry VIII (1933), his disgruntled Henry bloody-mindedly mocks Tudor politesse by tossing hunks of cooked fowl over his shoulder; when his Captain Bligh, a porcine sadist who might have been drawn by the eighteenth-century cartoonist Thomas Rowlandson, tells Fletcher Christian (Clark Gable) that he’s “a mutinous dog” in Mutiny on the Bounty (1935); when his pumped-up Lancastrian bootmaker, who lords it over his daughters in Hobson’s Choice (1954), half dances home in a beery haze. Laughton harnessed his bulk to his characters’ emotions rhythmically. The common perception was that he was “ugly,” but this is unfair. In Rembrandt (1936), Laughton’s deeply moving portrayal of the painter in mourning, his rapt, sensual paean to his dead wife, renders him beautiful. Similarly, his Quasimodo’s tenderness toward Esmeralda in The Hunchback of Notre Dame (1939) counters his grotesqueness. The poetic sensibility of these characters negates the sense that they stray from verisimilitude, which can also be said of Laughton’s only directorial outing, The Night of the Hunter (1955). A psycho-thriller that morphs into a fairy tale via the hunted children’s dreamy journey downriver, that southern gothic masterpiece was misunderstood in its time, and Laughton never directed again.